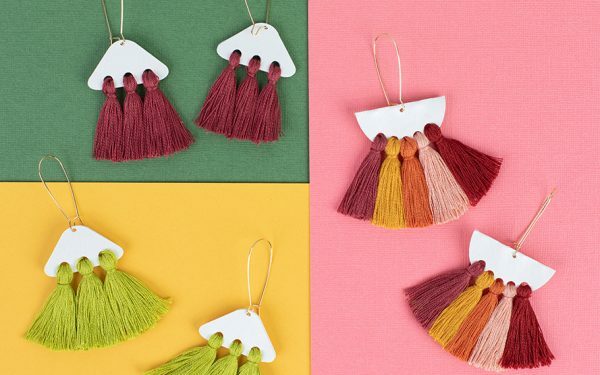 My favorite phrase to describe the Silhouette machine is “Swiss Army Knife.” Not only does it cut a variety of materials but there are also so many crafting project possibilities! This month, I tried out a new project type (glass etching) that honestly seem a little daunting, but oh my gosh folks, it is SO easy! While I was cleaning out our photo/memory drawer (thanks Marie Kondo! ), I came across my and my husband’s wedding vows. They were folded and a little worn-looking, so they are certainly not something I want displayed in our house. Then light bulb! 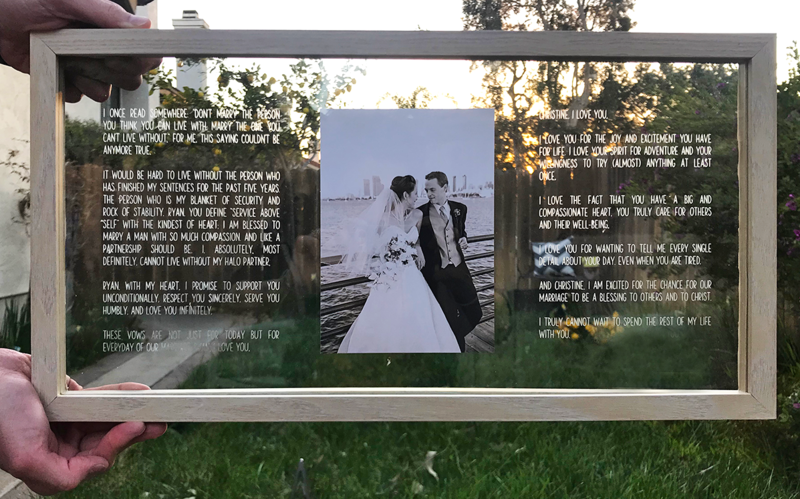 I created this project featuring our vows glass-etched on both sides of one of our favorite wedding photos! 1. In Silhouette Studio®, draw a 5-inch-by-7-inch rectangle. This will be your boundary box for your text. 2. 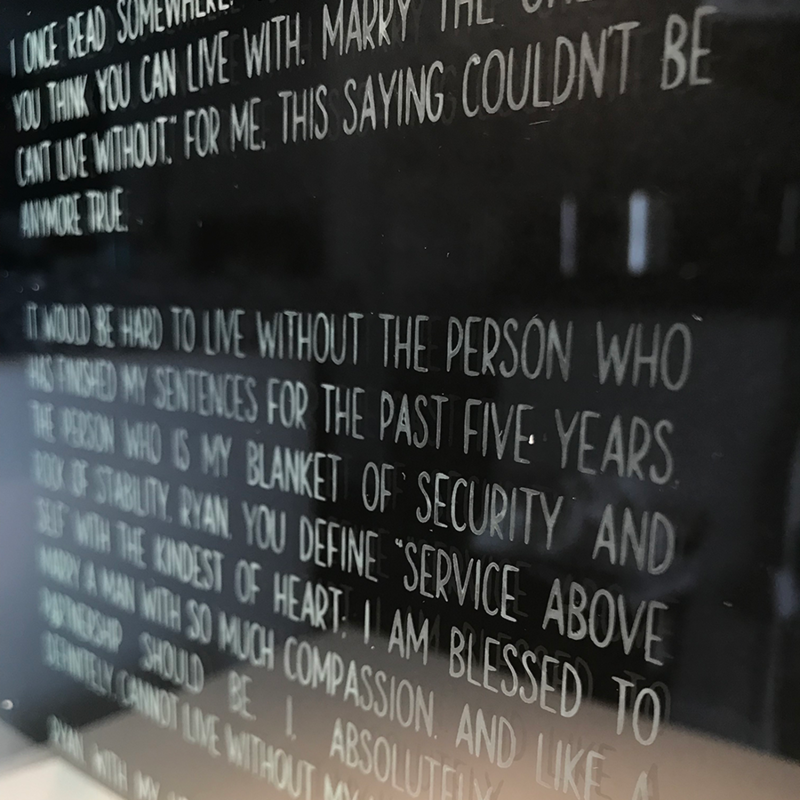 Insert text and type up vows using the font of your choice. NOTE: I used Design ID #268700 because it would be fairly easy to weed compared to a script font. 3. In the Text Style panel, select Full Justification. NOTE: Of course, this step is optional. Pick whatever justification that you prefer. 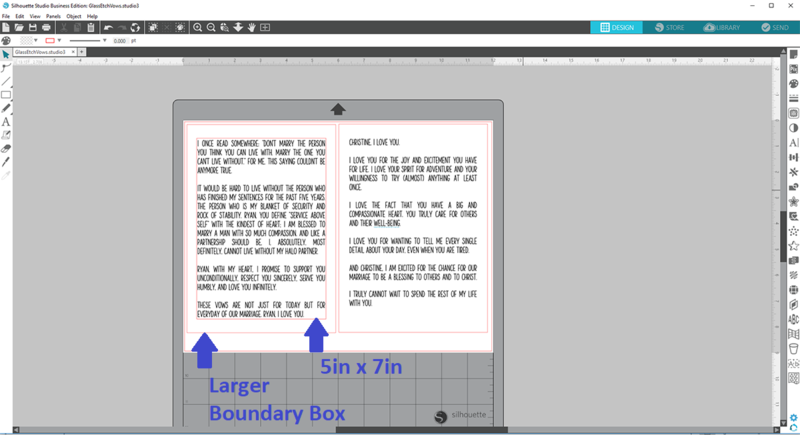 5-inch-by-7-inch boundary box to a larger boundary box so that there is a margin on all sides of the text. 5. Next, place your vinyl on the cutting mat, load your cutting mat into your Silhouette machine, and Send the design to your Silhouette with the proper cut settings. TIP: I recommend doing a test cut first. Once the vinyl is cut, remove it from cutting mat. 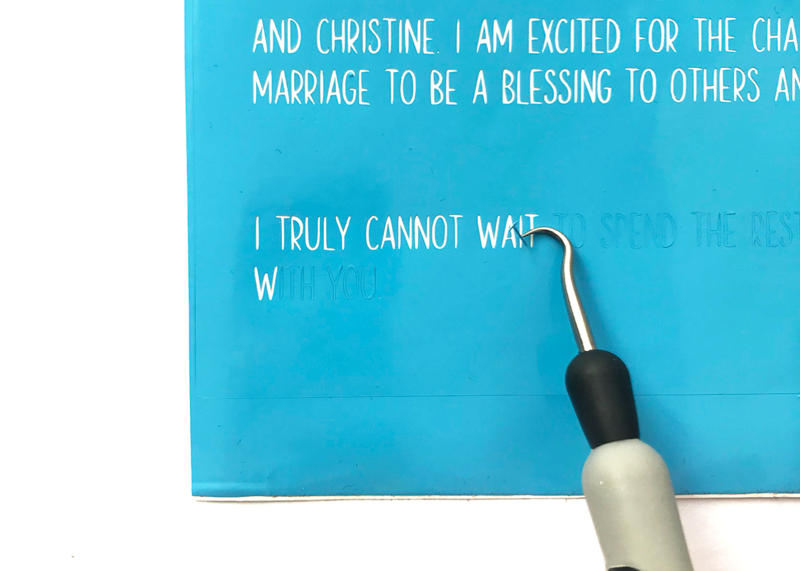 Using the Silhouette hook tool and tweezers, remove the vinyl border and letters. Be careful not to remove the small pieces inside the letters. Remember, we are using the vinyl as a stencil for glass etching, so you need to remove the positive space, not the negative space. 6. After weeding, cut a piece of transfer tape that is slightly larger than the piece of vinyl. Place the cut transfer tape over the weeded vinyl and burnish it with the scraper tool. 7. 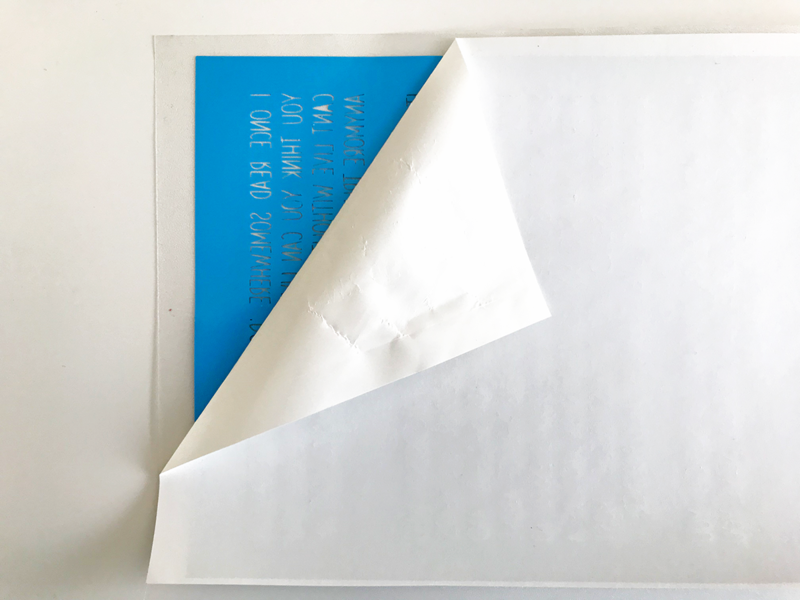 Carefully peel away the vinyl backing so that the weeded vinyl is now on the transfer tape. 2. 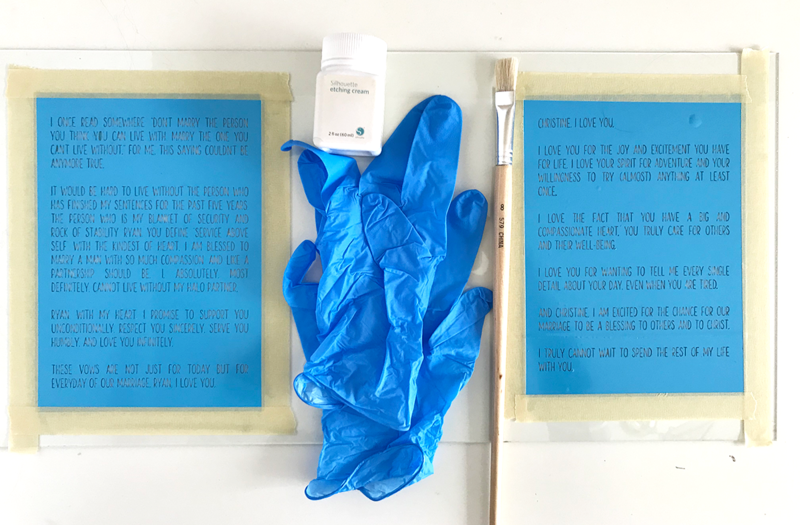 Carefully place the transfer tape and weeded vinyl piece where you want on the glass. 3. Tear off strips of masking or painter’s tape to give you extra border protection (from the etching cream). 1. Before opening the etching cream container, shake it well. TIP: I suggest even giving it a good stir with a craft stick or bamboo skewer. Put on disposable gloves for your protection. 2. Dip your paintbrush into the etching cream and then brush it lightly, carefully, and generously over the weeded vinyl. 3. 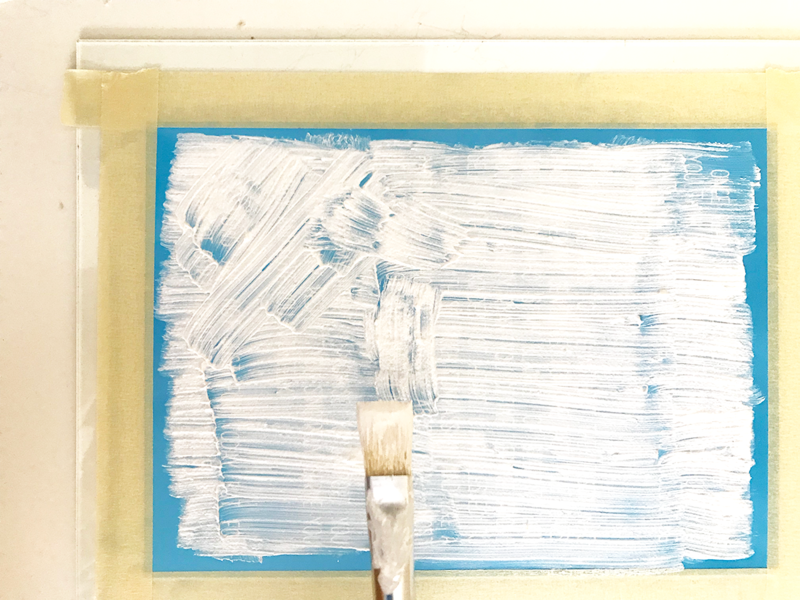 Move your brush in various directions to make sure the etching cream makes complete contact with the glass surface. 4. Let the etching cream sit for a minute before you remove any painter’s or masking tape and rinse off the etching cream. You may need to gently rub off the etching cream under running water to remove it. 4. Dry the glass with a paper towel. 5. Remove the vinyl to reveal the etched design. 1. Insert a 5-inch-by-7-inch picture how you would like to see it in the picture frame. Secure it to the glass with adhesive dots. 2. Place the glass back into the picture frame and tighten or turn fasteners to secure the glass. Wouldn’t this be such a great anniversary gift?! Honestly, I almost gave up on this project! 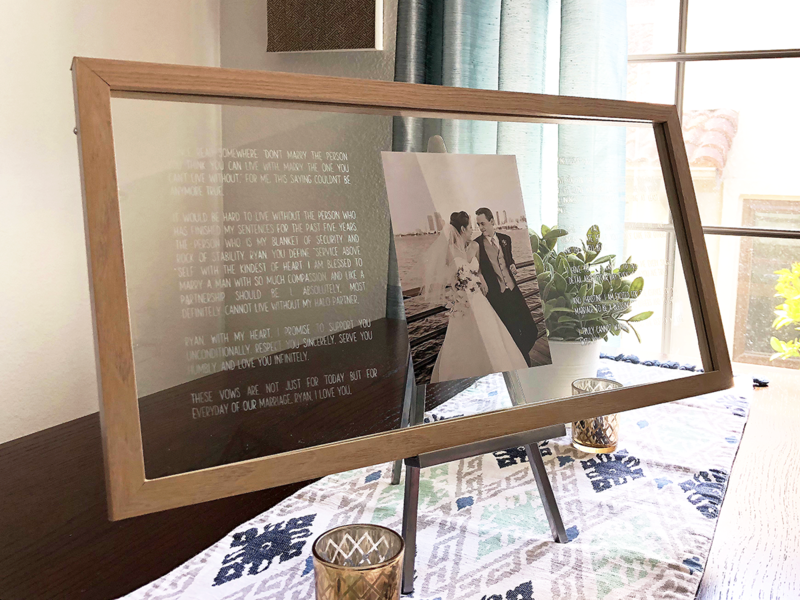 I didn’t think our vows would fit on the picture frame I bought, and I wasn’t going to buy a larger frame because, um, weird couple shrine-like photo?! No thanks! BUT my heart and crafting moxie told me otherwise, and I’m SO glad I carried through with this project. It is beautifully hanging on our bedroom wall, and I truly love waking up every day and re-reading our promises to each other!